Daily Illuminator: Holiday #PlayMunchkin Retailer Event Locations! 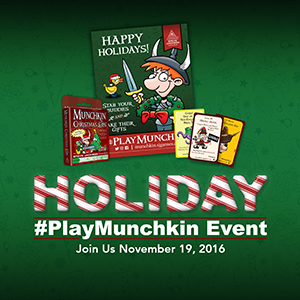 November 10, 2016: Holiday #PlayMunchkin Retailer Event Locations! The holidays are on the way, so we're sharing our cheer with stores around the country (and world) that are participating in our #PlayMunchkin Holiday Event with a Retail Kit! These kits include tons of unique promo cards, bookmarks, and even a demo game. Now all we need is you! Head to your friendly local game store on Saturday, November 19, play Munchkin, post pics of yourself playing to social media, and tag your store! Not only will you have some haul-iday fun, you'll be entered in our weekly contest. (It's better to give than receive . . . except when you're receiving Munchkin.) So stop by your local shop, play some Munchkin, and get some awesome swag. Check the list of stores to see if your favorite location is participating, and join us November 19 for the game day!